You know how sometimes a certain smell or sensation, or even an actual place, can trigger a whole avalanche of memories and emotions? For Professor Isak Borg, it’s a wild strawberry patch at his family’s abandoned lakeside house. After a particularly disturbing dream in which he confronts his own mortality, the 78 year old Professor (played by veteran Swedish actor/director Victor Sjostrom) decides to pay this special place a visit. 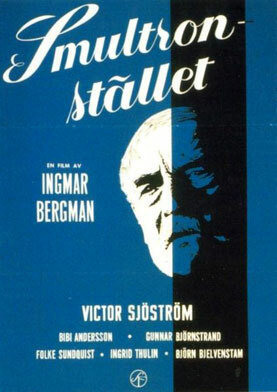 Instead of taking the train from Stockholm to Lund where he is due to receive an honorary doctorate, he decides to drive, and is accompanied by his daughter-in-law, Marianne (Ingrid Thulin) who proceeds to confront him with a frank analysis of his character. “A confidant pedant”, “an inflexible egoist”, “utterly cold”; these are just some of the descriptions of his personality and in the face of them, Isak is forced to examine the events that have made him such a man. First stop on this black and white road movie is the eponymous strawberry patch where Isak conjures a vision of his cousin and former fiancée Sara (Bibi Anderson). She appears like a blonde angel, picking a basket full of the bittersweet fruit on a halcyon summer day. If not for an assault on her innocence by his own brother, in which the strawberries are symbolically spilled, this heavenly creature could have been his. But this was just the beginning of a string of disappointments that shut the poor chap down, one by one. In the hands of the masterful Swedish writer/director Ingmar Bergman, we watch how, by confronting his most painful memories, the Professor gradually lets go of them and opens himself up to a present full of peace, not only within himself, but with those closest to him. Bergman wrote this redemptive tale in his late 30s while hospitalised for gastric ulcers and included in it many of the fears he was experiencing himself, such as a recurring dream in which he sees his own body reaching out to grab him from a coffin. Death will get us all in the end but it’s how we live that matters – that’s the ultimate message of Wild Strawberries. If you have a grumpy old relative, be sure they see this film. It could very well change their outlook.